I used to start writing Christmas ads for various companies around about April. 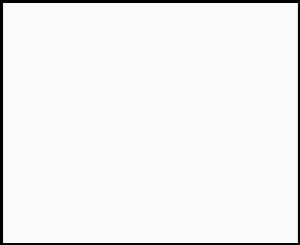 That’s the kind of lead many clients needed. You want a Christmas book at a big publisher company? Pitch it in January. The year before, if it’s DC. Anyway. 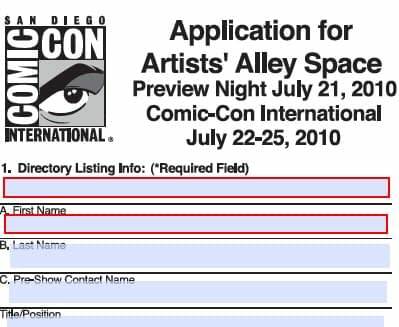 The deadline for the Artists Alley tables at next year’s San Diego Comic Con has been moved up. 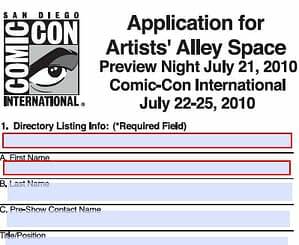 The application form (below) needs to be returned to the Comic Con by September 15th. So, if you have plans to exhibit there, even though we’re talking almost eleven months away, get on it.